Caterers & Bartenders — BEEHIVE FLORAL CO. 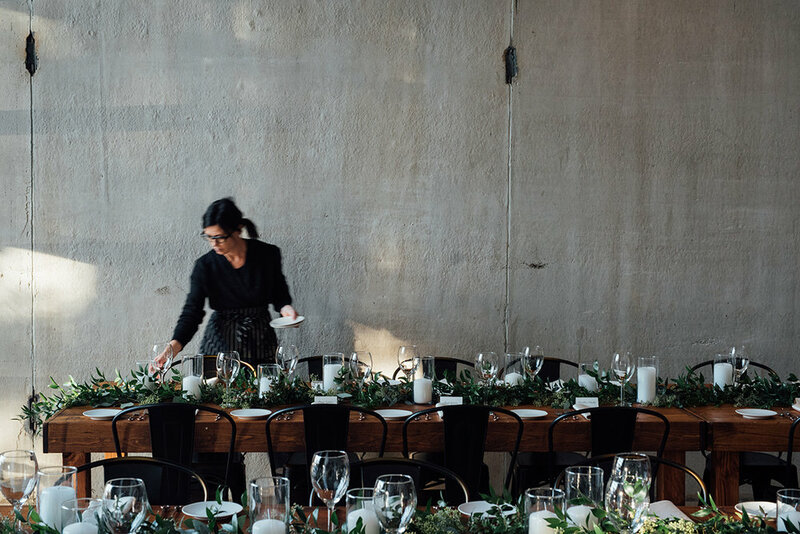 There are so many options in food and drink for your wedding from food trucks to full candlelit dinners that the choices can be overwhelming. I recommend thinking about your day in terms of time first before budget when it comes to food. What time does the wedding day start and when does it end? How long will your guests and wedding party be with you and will they have time to grab a bite to eat before the reception if there won't be a full dinner. Even with a smaller budget, planning for a simple food truck or buffet can make all the difference for hungry guests. Here are a few of my favorite picks from simple to grand. Photo by Bright Bird Photo. Ice Cream Sandwiches by The Baked Bear. Best option ever for the casual wedding with an eclectic flair. I worked a wedding at the Hollow near Sundance, the setup portion of which featured watching the Black's Sliders food truck amble down a narrow and steep mountain path in order to make it to the creekside wedding venue below. So these guys are nothing if not committed and the food smelled amazing. The fact that they only serve hormone & antibiotic free ethical farm to table food is an added bonus. This was a wild forest wedding with a jubilant boho feel and the nearby food trucks and ice cream sandwich treats (rather than traditional wedding cake) could not have been more perfect for their mood. Bellies were satisfied and the fun-loving guests were not disappointed. Emery of the Blended Table. Photo by Tess Comrey. Floral by Beehive Floral Co. Incredible style, delicious and beautiful food, and a stunning venue should you need it. Colour Maisch, co-founder of the Blended Table is an old friend of mine and an incredibly talented artist in her own rite so I was really thrilled for the opportunity to work alongside her and Emery for this beautiful wedding catered by them at their stunning venue in downtown Salt Lake City. I was immediately astonished at the beauty and simplicity of the space. Colour and Emery and their team were the ultimate professionals, swooping in and setting up at lightening speed and with flawless precision. I could not imagine a more Pinterest-worthy wedding day for this sweet couple and it was such a joy to add my floral as the final touch of a near perfect day. I happen to know they both do a lot of research and travel when it comes to cuisine and they are ever evolving in their craft. I would highly recommend them for a full formal dinner or buffet style event. The best Old Fashioned I've ever tasted, and some seriously nice fellows. I met Nice & Easy Co. first at a wedding earlier last season and second at a great outdoor cocktails workshop with Barebones Living where I was served the best Old Fashioned I have ever tasted. These guys are professional, skilled at their craft and just the right combination of old world service and new world mixology. Website: Nice & Easy Co.